Saw an interesting interview with Gordon Wood, an American History professor at Brown. Wood is 74, but full of enthusiasm for his subject; he’s unpretentious, but not blasé. He’s unpolitical, and he decries the politicization of history; he also decries the current view that the most worthy topics for historical research are race, gender, and class. He insists that a historian should be disinterested. He says that history is a mode of understanding, a way of seeing the world, it isn’t vocational training, and it doesn’t equip you for a job. He says that historians should aim their work at a wide audience, they shouldn’t aim only at fellow academics. He says that his own books are part of an older tradition, a tradition that aimed at both a scholarly audience and a general audience. He says that the failure of academic historians to reach a wide audience has created an opportunity for non-academic, popular historians — David McCullough, for example, and Shelby Foote. Wood mentions two contemporary historians who, like himself, aim to be both scholarly and popular: Joseph Ellis and David Hackett Fischer. Ellis wrote (among other books) biographies of John Adams, Thomas Jefferson, and George Washington. Fischer wrote books on Paul Revere’s ride, and Washington’s crossing of the Delaware. Fischer also wrote Albion’s Seed: Four British Folkways in America, which argues that American mores were created in England. Wood says that this argument ran counter to the dominant tradition in American history — namely, the Turner Tradition, which says that America was shaped by the virgin land, the open spaces, the frontier. When Wood was asked about Lincoln, he said that the leading Lincoln historians are David Herbert Donald and Doug Wilson. Wood said that Lincoln had a tragic sense that is unusual for an American. He said that Lincoln felt he was being carried along by fate — also unusual for an American. When asked what historian he would recommend to a young student, he said, “Someone they would enjoy — perhaps Rick Atkinson, who writes military history, or Laurel Ulrich, who wrote Midwife’s Tale.” Wood also praised Philip D. Morgan, who has written about slave life. I sent e-mail to Wood, asking him to recommend a one-volume history of the U.S. I asked him if the best such book was Paul Johnson’s History of the American People. Wood responded, and said that Johnson’s one-volume history wasn’t the best, but he didn’t know what was the best; obviously, Wood isn’t a fan of Johnson’s popular, journalistic style. Perhaps the best one-volume history is The Growth of the American Republic, by Commager and Morison; for many years, this book was used in American schools. Commager and Morison are interested in style as well as scholarship. Before leaving the subject of American historians, I’d like to mention Willard Sterne Randall. Like Joseph Ellis, Randall has written several biographies of people from the Revolutionary era; Randall has written biographies of Washington, Jefferson, Hamilton, Benedict Arnold, Ethan Allen, etc. Randall went straight from high school to a career in journalism. He was a journalist in the Philadelphia area then, at age 40, he went to graduate school at Princeton, but never earned a Ph.D. He taught for several years at the University of Vermont, and currently teaches at Champlain College. The last line (“Bury my heart at Wounded Knee”) was used by Dee Brown as the title for his popular history of American Indians, a history which focuses on the mistreatment of the Indians. Just got back from Montana [Hank writes, in a recent e-mail], performing the 90-minute show (“Shakespeare’s Treason”) at the Flathead Valley Community College, in a state of the art theater (3/4 in the round) and crowd of 250, and this was a big test that turned out exceptionally well. Best part was that no one had to know anything about Shakespeare going into the theater; at the end a standing sustained ovation and an hour’s worth of students (and adults as well) coming up to me and expressing their enthusiasm and interest. This was co-written by me and Ted Story, a NYC director and member of the SOS. Ted directed the show and I know I could not have done it by myself, for various reasons related to both script and performance. The goal was to go over the heads of the bickering colleagues of the scholarly community and get on with life, eh? It worked. We’re in the process of gearing up for a long haul with this, on the road and in NYC as well, not to mention DVD and other outlets such as a printed script. I finally completed revising my book of aphorisms. I’m planning to print a few copies through Lightning Source, who specializes in print-on-demand. Lightning Source only charges about $100 to setup a book, and then about $5 per copy. This is much cheaper than a traditional printer, so I can print revised versions, new books, etc. Print-on-demand makes self-publishing much easier. You don’t need to print hundreds of books, then wait years to sell them; you can print just enough copies to meet demand, and revise frequently. More than ten years after publishing in China, I finally got my first piece of reader feedback, an e-mail message from a young woman who read my book when she was a high school student. She says she’ll translate my new version into Chinese; she’s a good translator, and has already translated enough to show to publishers. Hopefully, I’ll be able to publish my new version in China and Taiwan — two countries where my old version had some success. The neocons and Straussians are anti-Nietzsche. They insist that Nietzsche was a nihilist. In fact, Nietzsche wasn’t a nihilist; he affirms life, he affirms traditional culture, he affirms the past and the future, he opposes Schopenhauer’s pessimism. True, he opposes traditional moral attitudes, and he opposes traditional religions, but this doesn’t prevent him from admiring pre-Christian culture (especially Greco-Roman culture), it doesn’t prevent him from admiring Renaissance culture (Montaigne, Machiavelli, etc. ), and it doesn’t prevent him from admiring later writers such as Goethe, Emerson, Stendhal, etc. Nietzsche isn’t a nihilist; Nietzsche is for more than he’s against. The neocons are opposed to anti-Americanism, but they should remember that most leading intellectuals were critical of their own nations. Since the days of Socrates, leading intellectuals have often viewed themselves as citizens of the world, not of a particular nation. Nietzsche never tired of castigating his fellow Germans, castigating German nationalism, etc. Joyce often spoke scornfully of Ireland. Ibsen left Norway, and lived in voluntary exile. The Hebrew prophets, who were the leading intellectuals of their time, decried the ways of their countrymen. Criticism may be more beneficial, more healthy, than praise. Anyone with a high ideal, and a fervent admiration for earlier cultures, will criticize his own nation. Indeed, such a person will be inclined to criticize institutions in general — churches, universities, etc. — because institutions fall short of the ideal, and are often inhospitable to the independent thinker. I’m not suggesting that all anti-Americanism is appropriate and beneficial; doubtless much of it is shallow and misguided, and deserves the scorn that the neocons pour on it. But the neocons should be judicious in their criticism, and should remember that there’s a long and glorious tradition of criticizing one’s own country. The neocons and Straussians ignore Eastern philosophy completely, but it’s too important to ignore. Traditional monotheism can’t meet the spiritual needs of today. The neocons criticize those who break with traditional monotheism as “seculars” but there are new approaches to religion that are neither traditional nor atheist. We can break with traditional religion and with rational philosophy, but still not fall into chaos; there are other approaches to religion, and other approaches to philosophy. A non-rational approach can satisfy both spiritual needs and intellectual demands. There’s a kernel of truth in the New Age thinking that the neocons despise, just as there’s a kernel of truth in the counter-culture movement of the Sixties. One of the neocons’ favorite words is “citizen” (or “citizenship”); to be a good citizen is one of their highest values. I’d like to ask them, “Did Proust ever think about being a good citizen?” Proust focused on literature, not citizenship, and he made a lasting contribution to civilization. And we can’t tell who’s the next Proust. The kid next-door, who seems merely odd, might be the next Proust. If the neocons themselves want to strive to be good citizens, I applaud them for it, but they shouldn’t set up their values as universal values, and criticize others for falling short of them. Let each march to his own drummer. Let Proust stay in his cork-lined room; he may accomplish as much there as the soldier who dies for his country. All honor to the soldier and the citizen, but their ideals aren’t the only ideals. I’ve long been fond of a poem called “The Lake Isle of Innisfree,” by William Butler Yeats. During his childhood, Yeats spent much time in County Sligo; Yeats’ attachment to Sligo might be compared to Proust’s attachment to Illiers. Yeats had a special fondness for Innisfree, an island in Lough Gill. In his Autobiography, Yeats said that, as a teenager, he thought about building a cabin on Innisfree, in imitation of Thoreau. “The Lake Isle of Innisfree” was published in one of Yeats’ first poem-collections, The Rose. Click here for a recording of Yeats reading “The Lake Isle of Innisfree”; I recommend it. I recommend a 2-hour Whitman documentary that is part of the “American Experience” series. In general, I prefer prose fiction to poetry, but I find that poetry works well on TV, perhaps because it’s made to be read aloud. I project myself — also I return — I am with you, and know how it is. Just as you look on the numberless masts of ships, and the thick-stemmed pipes of steamboats, I looked. The time will come, though I stop here to-day and to-night. Whatever it is, it avails not — distance avails not, and place avails not. I considered long and seriously of you before you were born. Consider, you who peruse me, whether I may not in unknown ways be looking upon you. Whitman is the poet of New York City, as Melville is the poet of the open sea, and Twain is the poet of the half-civilized frontier, and the Mississippi River. I also recommend a Hemingway documentary, part of the American Masters series. Jack London reminds me of Thomas Wolfe. Like Wolfe’s novels, London’s White Fang is a fast-moving, hard-charging story, but it doesn’t have one, all-embracing plot; rather, it has a series of episodes. London is rougher than Wolfe — closer to the frontier, closer to nature. Wolfe has more education, more degrees, more literary ambition, and is more introspective than London. White Fang is full of action, but you never lose the feeling that this is a novel, this is an author trying to entertain the reader. White Fang doesn’t draw you in, it doesn’t make you suspend your disbelief, it doesn’t convince you that it’s a real world, it doesn’t make you empathize with the characters as if they were real. He made overtures to White Fang from the first. White Fang began by ignoring him. Later on, when the overtures became more insistent, White Fang bristled and bared his teeth and backed away. He did not like the man. The feel of him was bad. He sensed the evil in him, and feared the extended hand and the attempts at soft-spoken speech. Because of all this, he hated the man. With the simpler creatures, good and bad are things simply understood. The good stands for all things that bring easement and satisfaction and surcease from pain. Therefore, the good is liked. The bad stands for all things that are fraught with discomfort, menace, and hurt, and is hated accordingly. White Fang’s feel of Beauty Smith was bad. From the man’s distorted body and twisted mind, in occult ways, like mists rising from malarial marshes, came emanations of the unhealth within. Not by reasoning, not by the five senses alone, but by other and remoter and uncharted senses, came the feeling to White Fang that the man was ominous with evil, pregnant with hurtfulness, and therefore a thing bad, and wisely to be hated. 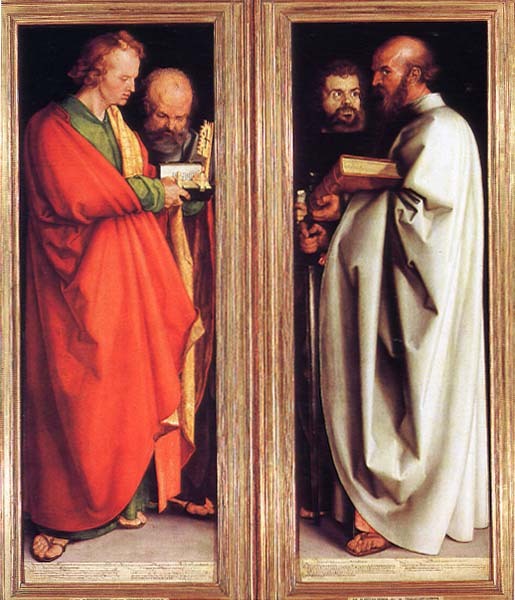 St. Paul looms large in Durer’s painting partly because of his importance in Protestantism, and St. John looms large partly because he was Luther’s favorite evangelist, and Durer was a Luther fan. One wonders what revolutions Panofsky has in mind when he says, “As is always the case with revolutionary movements...” Doubtless he has the French Revolution in mind, but what others? His remarks fit China’s Cultural Revolution, but they were written in the 1940s, and the Cultural Revolution started in the 1960s, so he couldn’t have that revolution in mind. Perhaps his remarks also fit the Reformation in England; one thinks of the Levellers, and other English radicals. I received an e-mail from someone who’s looking for R. H. Blyth’s edition of Thoreau’s Journals. My correspondent noticed that I mentioned Blyth’s edition on my website. I told him I found it at Brown’s Rare Book Library. It’s a good edition, albeit only a few dozen pages. Blyth himself recommends a longer edition, which he used to make his edition: The Heart of Thoreau’s Journals. My correspondent reminded me that Blyth also made an edition of Thoreau’s Week on the Concord and Merrimack Rivers. Hopefully, all of Blyth’s works will be available online soon.